Fox wall jumping in Melee. Fox wall jumping in Brawl. The wall jump is a technique unique to certain characters. 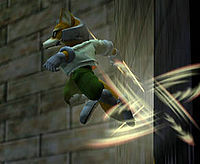 Introduced in Super Smash Bros. Melee, wall jumping consists of the character momentarily clinging to the wall, then turning away, and finally jumping back. It is performed by touching a wall and then pressing the control stick or d-pad in the direction opposite the wall. In Brawl, it can also be performed by pressing the jump button when touching a wall. A wall jumping character experiences a short period of invincibility at the moment they kick off the wall. One cannot wall jump forever, as the height gained from each successive wall jump decreases until they stop gaining any height at all. Additionally, all characters can perform a wall jump directly after wall teching. This technique is often used by players recovering against an edge-guarder. *: These characters can also wall cling. The wall jump is a common ability in platforming games. Several of the characters who have wall jumps here have had them in games of their own. Mario, Samus, Sonic, Mega Man and Pac-Man have performed wall jumps in their own series: Mario in Super Mario 64 and its sequel of sorts, Super Mario Sunshine, the New Super Mario Bros. series, the Super Mario Galaxy series, Super Mario 3D Land and 3D World, Super Mario Maker and Super Mario Odyssey; Samus in all games except Metroid, Metroid II, and Metroid Prime; Sonic in Sonic the Fighters (also known as Sonic Championship), Sonic Heroes (in the latter Sonic could do a horizontal wall jump known as the Triangle Jump), Sonic the Hedgehog (2006), Sonic Unleashed, Sonic Colors, Sonic Generations and Sonic Lost World; Mega Man in Mega Man: The Power Battle, Mega Man 2: The Power Fighters and Marvel vs. Capcom; and Pac-Man in Pac-Man World 3. There is some debate as to whether or not Super Mario Bros. is the first instance of wall-jumping in Nintendo games, as in that game the technique was a glitch (which may have become noteworthy enough to be included as a real mechanic later on in Super Mario 64); however, the Mario series is generally given credit for popularizing the move. 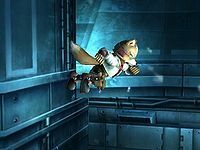 Some characters unable to wall jump in the Super Smash Bros. series have been able to wall jump in their own games. Luigi can wall jump in the New Super Mario Bros. series (but not in Super Mario 64 DS, in which it was a power unique to Mario), and in Super Mario 3D World along with Peach and Rosalina. Donkey Kong can wall jump in Jungle Beat. Kirby can wall jump with the ninja ability in Kirby Super Star, though it functioned more like a wall cling. Pikachu, Mewtwo, and Dr. Mario are the only veterans to gain the ability to wall jump in games released after Melee. Cloud, Toon Link, and Young Link are the only swordsmen that have the ability to wall jump. Luigi could wall jump in the E3 Demo Build of Super Smash Bros. for Nintendo 3DS, but cannot in the final game. In SSB4, Pac-Land is the only stage whose Ω form's walls cannot be wall jumped on. Kalos Pokémon League's Ω form also used to share this distinction in Smash 4 before version 1.1.3. Inklings cannot wall jump in their own series. However, they can swim up walls that are covered in ink of their color. The manual for Ultimate previously stated that Simon could wall jump. This is false, as neither Belmont can, and his name was later replaced with Pac-Man's. This page was last edited on April 3, 2019, at 19:28.